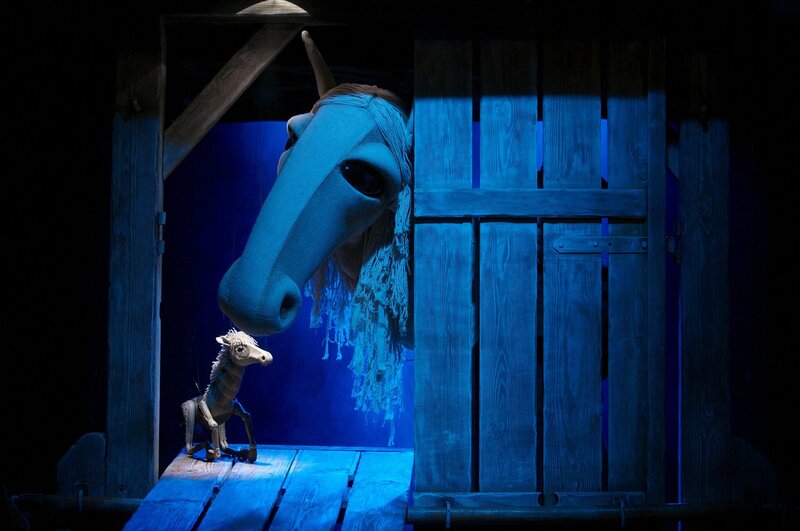 Russian puppet theatre based in Saint Petersburg. The official date of its founding is May 16, 1931, the date on which was staged the show Inkubator (The Incubator), a children’s play (narrated by Petrushka) about a team of young pioneers managing a chicken breeding farm. 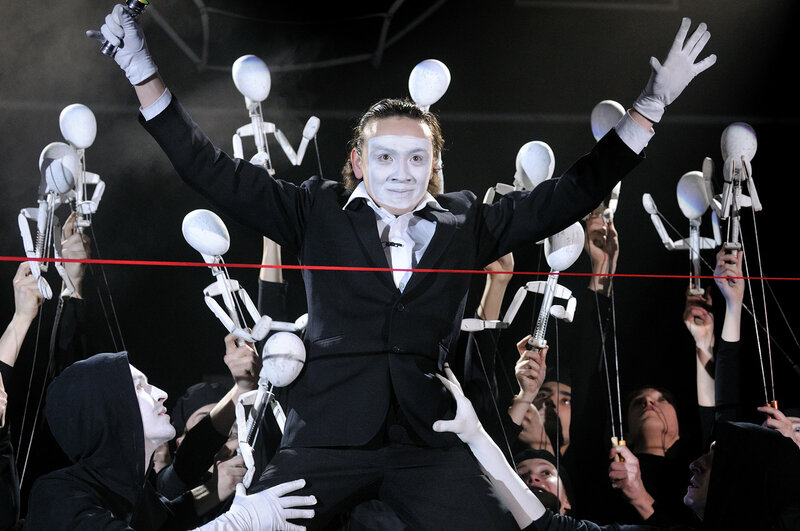 Like many other Russian puppet companies, the Bolshoi teatr kukol (literally, Big Puppet Theatre) began as an amateur company staging propagandist shows. 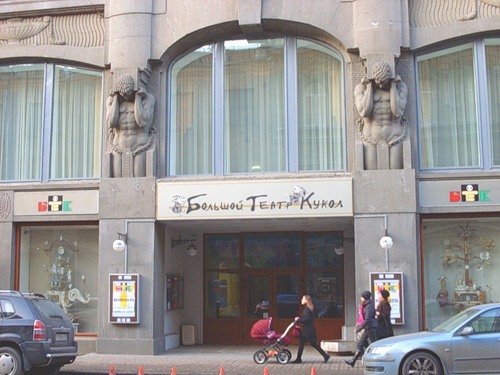 The theatre is officially regarded as Russia’s second largest State puppet theatre after the Sergei Obraztsov State Academic Central Puppet Theatre (Gosudarstvenny akademichesky tsentralny teatr kukol imeni S.V. Obraztsova). In 1932, drama actor and director Savely Shapiro (1906-1948) became the theatre’s artistic director. Now, world classics were to replace the propaganda, Anton Chekhov and Romain Rolland in particular. Shortly before he died, Shapiro staged a subtle, poetic production, Skazanie o grade Lebedintse (Legend of the Town of Lebedinets, 1948). The theatre’s activities in the 1950s and 1960s were mainly linked to the work of Mikhail Korolev. His most exciting production staged in collaboration with stage designer Ivan Korotkov (1902-1985) and puppet designer Valentina Malakhieva (1923-1997) was V zolotom raju (In the Golden Paradise, 1959), based on Karel and Josef Čapek’s The Life of Insects. The show epitomized Korolev’s views, quite revolutionary at the time, of putting puppets, shadow theatre and cinema along with live actors into action at the same time. 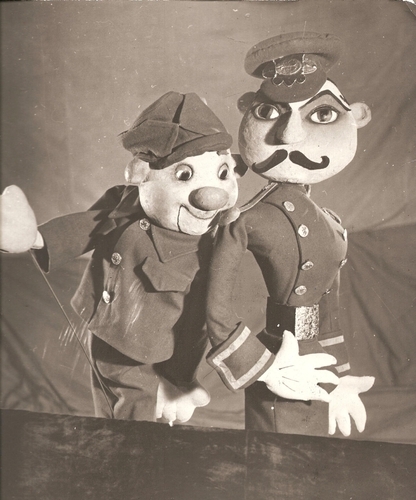 This production received the Grand Prix and a Gold Medal at the 1958 Bucharest International Puppet Festival in Romania. In 1964, Viktor Sudarushkin (1936-1986) became the head of the theatre. Together with designers Vladimir and Valentina Khovralev, he continued to develop the theatre’s innovative image. Its productions, such as V 12 chasov po nocham (Midnight Every Night, 1971), a musical, Pokhozhdenia bravogo soldata Shveyka (The Adventures of the Good Soldier Ŝvejk, 1973), and Do tretiikh petukhov (Till the Third Rooster Crows, 1976), were all distinguished by the unusual literary material (the classic Czech novelist Yaroslav Hašek and the contemporary Russian novelist Vassily Shukshin), the eccentric direction, and the use of diverse puppetry techniques, some of which were ground-breaking for the Soviet puppet theatre of the period. The Bolshoi Puppet Theatre is also famous for its school of puppet manipulation. Masters like Valeria Kiselyova (1916-2000), Ilya Alperovich (1917-1985), Vladimir Martyanov, Lioubov Donskova, Vladimir Korzakov and Vladimir Kukushkin (1925-2007) were virtuoso manipulators of all traditional puppet systems, with Kukushkin being referred to as the “Paganini of the Puppet”. A new period of creativity and growth in the theatre’s development was linked to the activities of director Ruslan Kudashov. In 2005, he staged Nikolai Gogol’s Viy and Leo Tolstoy’s Kholstomer, thus reviving in the Bolshoi Puppet Theatre the once lost trend of staging productions for adults. In 2006, Ruslan Kudashov was appointed the theatre’s principal director. The same year the Bolshoi Puppet Theatre, together with the Saint Petersburg Theatre Arts Academy, enrolled a team of actors from the course lectured by Ruslan Kudashov. These graduates became members of the Bolshoi Puppet Theatre, contributing to the company’s repertoire with their experimental productions with puppets, staging, drama, and music. Goldovsky, Boris. Kukly Entsiklopediya [Puppets. Encyclopedia]. Moscow: Vremya, 2004, pp. 75-76. Leningradskomu gosudarstvennomu Bolshomu Teatru Kukol 50 let [50 Years of the State Leningrad Bolshoi Puppet Theatre]. Literary text by Anatoly Kulish. Leningrad, 1982.